State Champions – that is the title four Indian Hill High School (IHHS) students earned during the 2019 Ohio Economics Challenge sponsored by the University of Cincinnati and affiliated with the National Economics Challenge. 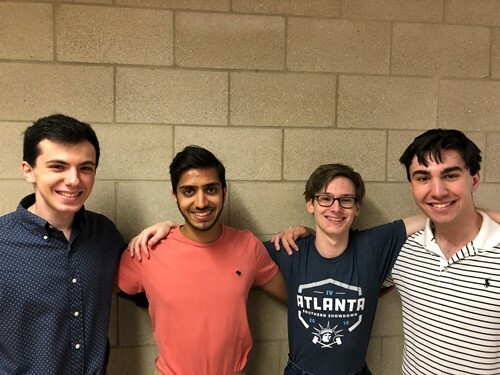 IHHS seniors Radu Dragomirescu, Ethan Shah, Cooper Pierce, and Mark Kholodenko were announced winners of the challenge (Adam Smith Division) April 3 after competing with students across the state by taking an online test during March. The top three scores for the team determine the team score. This is the second time in the past three years Braves earned the State Champion title. These four Indian Hill High School students will now advance in the competition and compete in the National Semi-Finals. The top eight finishers advance to the Nationals in New York City in May. Photo caption (L to R): Indian Hill High School 2019 Ohio Economics Challenge State Champions included seniors Radu Dragomirescu, Ethan Shah, Cooper Pierce, and Mark Kholodenko.